Alumnae and participants pose for a photo after the discussion. S.I.S.T.E.R.S. 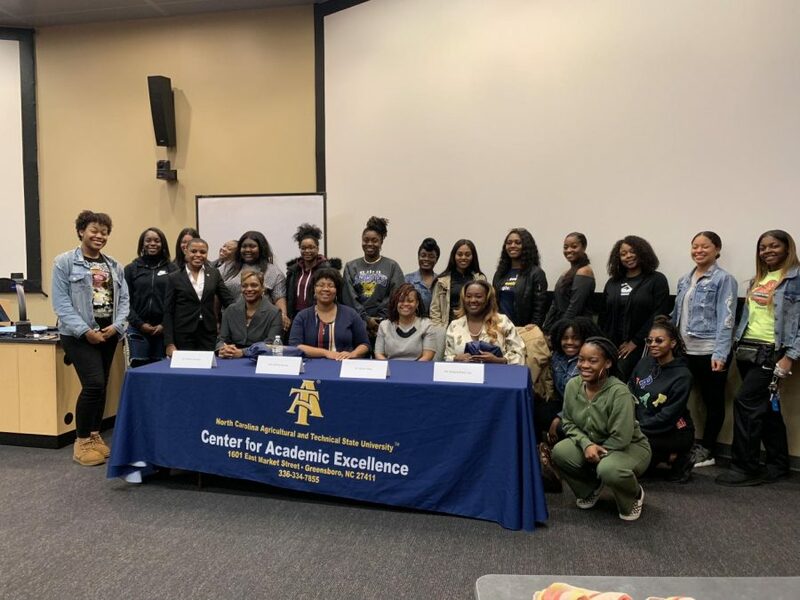 Mentoring Program hosted the panel discussion, Girl Power in the Workforce, to provide mentees with a chance to speak and hear from successful N.C.A&T alumnae. The panel discussion included Dr. Dorian Davis, Brittany Brady, Esq., Dr. Andrea Johnson and Brittany Gainey. The careers of these women varied from law, engineering, social work, finance, business consulting and sociology. With the panelist all being prominent in their different fields, each mentee was given the motivation to continue pushing toward their future career goals. “It’s about gaining wisdom. There are so many things you don’t know, and it is so important to have people that have walked in your shoes to be able to help you and get to where you want to be,” said Johnson. Johnson, who is the owner of A&J Consulting Services, helps individuals and business owners manage their personal finances, credit and debt. Throughout the program, members listened to the college of each panelist. They also shared their negative and positive encounters in the workforce, and life shortcomings. When asked about difficult incidents in terms of being African-American women in the workforce, overcoming prejudice was a reoccuring answer each panelist experienced at some point of their career. “They are really looking at you, how you deal with conflict and how you deal with change. They are always looking and always critiquing,” said Gainey, social worker for Harnett County school systems. Mentees asked questions and for advice on surviving their undergraduate, graduate, and/or law school years. They also desired insight on taking breaks from school, and also focused on what kept these successful and established women motivated. “It was the fact that coming from where I am from and the statistics of me being a person growing up in poverty, according to statistics I shouldn’t be here. So if nothing else kept me motivated to keep going, it was that.” said Brady, Esq., principal attorney and owner of Law Office of B.N. Brady, LLC. Her Law Office specializes in business entertainment, real estate, and criminal defense law. The panelist shed light on the importance of not giving up, traveling overseas when given opportunity, learning different languages, knowing your purpose and real passion, and most importantly “Whatever you decided to do be the very best at it” said Brittany Brady, Esq. After the discussion came to a close, participants in the program were provided time to not only network, but also become a mentee of the panelist that participated in the program.